It’s a bit of a thing at the moment, the ‘live in the studio’ album, and why not? If you’re good enough and the engineer’s good enough, you’ll have the satisfaction of creating something the way we did in the good old days before that pesky Les Paul invented multi-track recording. And with a bit of luck it might capture a bit of magic that would be lost in a song built up part by part. The Grahams have taken a slightly different direction with the concept; they’ve taken a bunch of songs from their “Glory Bound” album/“Rattle the Hocks” film project and re-recorded them in the studio with some friends, taking the opportunity to rearrange and rework the songs (sometimes more than once). And those friends: well, John Fullbright, North Mississippi Allstars, Alvin Youngblood Hart and David Garza are a pretty good start. The songs from this collection have already featured on two US albums by The Grahams, but none have been released in the UK in these versions, and I hope you all got that, because I’m not repeating it. Does the idea work? Well, mostly. “Glory Bound” is the obvious opener for the album, introducing the theme of the railroad with its ‘clickety-clack of the train on the tracks’ rhythm, stripped-back acoustic guitar, bass and drums arrangement and harmonies imitating a train whistle. Most of the original “Glory Bound” songs are reworked on this album, with the notable exception of “The Wild One” (for my money the best song on the album) and the gradual build-up of the beautiful ballad “Lay Down” to a massed choir ending, the gospel treatment of “Mama” and the counterpoint vocals at the end of “Blow Wind Blow” are all particularly effective. The supernatural ballad “Tender Annabelle” comes in a couple of different flavours, first with a mournful, menacing harmonica, electric piano and heavily-reverbed backing vocals, then with New Orleans horns to close the album. There’s a lot to be said for each treatment, although the first appearance of the horns on the rollicking “Kansas City” seems to lack a bit of punch. Minor quibbles aside, this is an album that’s worth listening to whether you’ve heard “Glory Bound” or not. The songs are powerful however you arrange them, and the live recording process catches some genuine moments of magic. 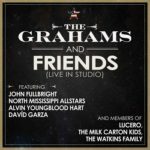 “The Grahams and Friends (Live in Studio)” is released in the UK on Three Sirens Music Group on Friday January 27th 2017.